French football club Olympique Marseille have apologised to fellow Lique 1 club Paris Saint-Germain and ordered their English bad boy midfielder Joey Barton to end his Twitter attack on PSG's defender Thiago Silva in which he likened the capital club's Brazilian defender to an 'overweight ladyboy'. In a series of tweets published through his official account, the on-loan QPR player questioned whether Silva was 'pre-op or post-op' and demanded an explanation why the 28-year-old had mentioned him before last night's Champions League quarter-final first leg against Barcelona. Marseille issued a statement on club website www.om.net apologising for Barton's remarks and promising an immediate end to the episode. It read: 'Olympique de Marseille and Joey Barton are keen to apologise to Thiago Silva and his club for the inappropriate comments made by the English player on social networks during the past 36 hours. 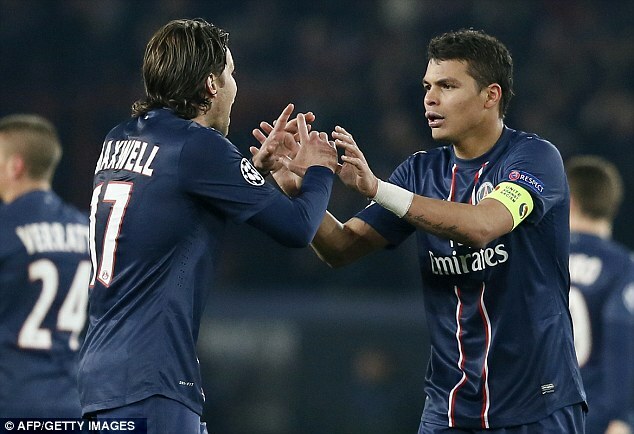 Ligue 1 leaders PSG earlier this evening expressed their unhappiness with Barton's 'unacceptable remarks' and threatened to 'take action' against the former England international. 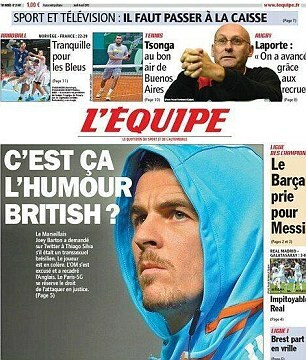 The apology came as French sports daily L'Equipe mocked Barton's British sense of humour on their front page. Their headline read: 'Is this the British sense of humour?' and said Thiago had been enraged by the remarks. 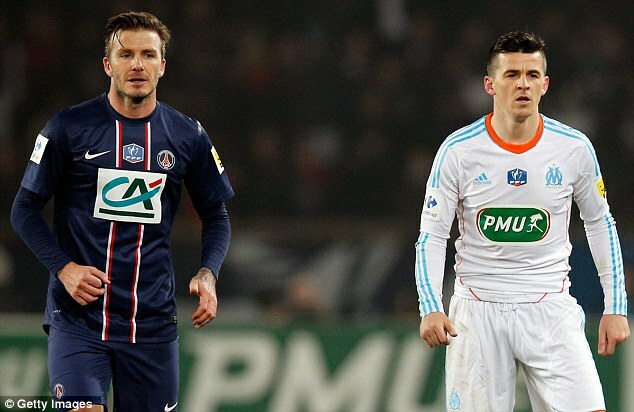 A statement published on psg.fr read: 'In the last few hours, on social networks, unacceptable remarks have been made by Olympique Marseille player Joey Barton against Paris St Germain player Thiago Silva. 'These attacks are serious and go beyond mere verbal jousting. The directors of the club, the players and the coaching staff are supportive of Thiago Silva and cannot accept such statements. 'They reaffirm their unwavering commitment to the values of respect that should govern our sport. The series of tweets against Silva began to appear on Barton's account from yesterday afternoon. The Liverpudlian was responding negatively to comments from Silva ahead of last night's game between PSG and Barcelona at the Parc des Princes, which finished 2-2 ahead of next week's second leg at the Nou Camp.